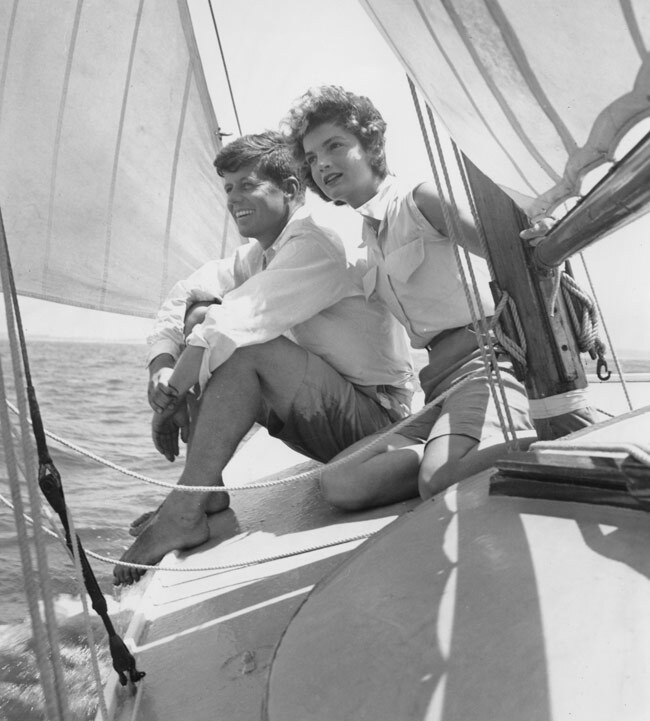 Senator John F. Kennedy and fiance Jacqueline Bouvier go sailing while on vacation at the Kennedy compound in June 1953 in Hyannis Port, Massachusetts. Photo: Hy Peskin/Getty Images. With the anniversary of JFK’s assassination upon us, we rounded up a slew of books expounding conspiracy theories about that much analyzed moment of American history, along with extensive biographies and photographic retrospectives on the tragically short life of the 35th president of the United States. Minutaglio and Davis explore the years of growing militant extremism in Dallas and propose this movement’s involvement in his murder. The city was full of powerful people virulently opposed to Kennedy’s presidency, including a radical ex-general, Edwin Walker, billionaire H.L. Hunt, and media mogul Ted Dealey, who reportedly confronted JFK and whose family name adorns the plaza where the president was killed. The narrative covers disturbing and relevant events in the city leading up to the assassination including the assault on U.N. Ambassador Adlai Stevenson just the month before and the November 1960 mob that swarmed then-Senator Lyndon B. Johnson. Scrupulously researched, Shenon’s new book looks at the Warren Commission, which was established by then-President Lyndon B. Johnson to investigate Kennedy’s assassination. With unprecedented access to the surviving commission staffers and many other key players, Shenon, a former New York Times reporter, gives readers behind-the-scenes access to the deliberations that shaped this (seeming flawed) inquiry into a national tragedy. Compulsively readable, the book features some of the most compelling figures of the twentieth century including Bobby Kennedy, Jackie Kennedy, Lyndon Johnson, J. Edgar Hoover, Chief Justice Warren, CIA spymasters Allen Dulles and Richard Helms, and head of CIA counterintelligence James Jesus Angleton. First published three decades ago as Conspiracy, Pulitzer-Prize finalist Summers has updated his best-selling account of the murder with the latest evidence and information. Using the popular opinion that Oswald did not act alone and looking at all the possible collaborators from the Russians, to the Cubans, to the Mafia or the CIA, Summers tries to fill in the gaps and makes a case for what information could be hidden in the intelligence files that will not be released until 2017. Like any defining moment in history, most people can recall with poignant clarity exactly where there were when they heard the news about the events in Dallas. Jodie Hansen channeled her grief about Kennedy’s assassination into this project, sending thousands of queries to famous and ordinary citizens, asking for their memories of that dark moment when they first learned of the president’s death. And she heard back from hundreds, including Bob Hope, Julia Child, George and Barbara Bush, and Mary Tyler Moore. Weaving together their stories, she presents a compelling look at the tragedy that united a nation. This coffee-table book contains much of the magazine’s classic photojournalism of the Kennedy’s lives up to the time of the assassination, and publishes for the first time all the unedited stills from the famous Zapruder film, along with a full reprint of the issue from 1963. There are also personal stories from notable celebrities and a new essay concerning the conspiracy theories.